Attention Anglers! A Menace to Rivers May Be Hitching a Ride! Meet the New Zealand Mud Snail (Potamopyrgus antipodarum), a very problematic, tiny snail (up to only 1/8th of an inch!) which is one of the latest invasive species to begin changing the Great Lakes ecosystem. 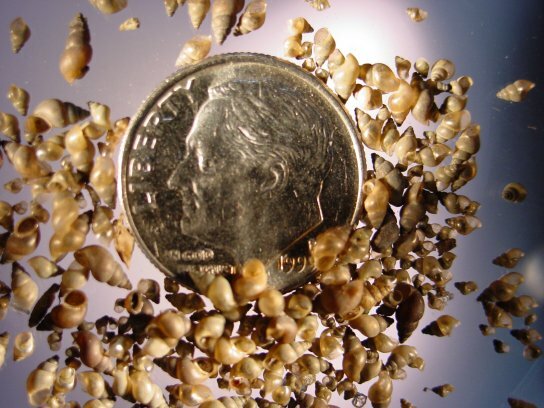 At a recent Oakland Township Stewardship Presentation, Emily Bovee and Kennedy Phillips of the Aquatic Ecology Lab at Oakland University shared their extensive knowledge and research on this hitchhiking snail that’s begun infesting Michigan rivers and lakes. The program was quite an education! Here’s a brief overview of some of the information they presented. Please note that the photos in this blog were generously shared by photographers from iNaturalist.org and by the researchers at Oakland University. Names and permissions are listed in the captions on their photos. Our state is surrounded by the Great Lakes, which hold 20% of the world’s freshwater. Unfortunately, it is also now home to 180 non-native species. How do these species get here? Waterway connections, e.g., the Sea Lamprey arrived through the St. Lawrence Seaway. Released pets and aquarium water. Aquaculture – the movement of fish or eggs from commercial fisheries may have brought the mud snail originally. The transport of exotic water plants can do it, too. Ballast water in ships can harbor them. For example, the invasive Zebra Mussel (Dreissena polymorpha) arrived this way and perhaps the New Zealand Mud Snail as well. Boats, other watercraft and recreational activity can spread the unwelcome New Zealand Mud Snail from river to river, river to lake. The problem with invasive species is that, once established, they alter the very environment in which our native creatures have lived for thousands of years. Often, for instance, they eat the food on which on our native species depend. By doing that, they can cause local extinctions and generally make the ecosystem less healthy, less able to adapt. Some, like the Quagga (Dreissena bugensis) and Zebra Mussels contribute to the creation of toxic dead zones caused by huge algae blooms that use up all the available oxygen in the water. What a mess! This very tiny menace is called a “mud snail” because it hides buried in the mud during the day and emerges at night to feed. It feeds on algae, decomposing leaves, or wood that falls into the water. As a result, mud snails live in areas where the current slows and plant material is deposited. That, of course, is also a place where anglers frequently find the fish they are seeking! Mud Snails Reproduce by Cloning Like Crazy! Although New Zealand Mud Snails are both male and female in their native range, the ones here in North America are all females – and they can clone like crazy! In fact, DNA analysis indicates that the millions of mud snails already in the U.S. originated from as few as three females! These snails produce live young about every 2-4 months and can produce over 200 hundred in one year, and each of those can produce 200 more – and well, you see the problem. The Oakland University researchers have found colonies of 30,000 in a square meter (about 10 square feet) in the Au Sable River, Michigan’s internationally known trout stream. In the western United States, where the snails have existed since 1987, researchers find 500,000 in a square meter! Tough Competitors Who Can Survive Almost Anything! These are tough little females! New Zealand Mud Snails are fresh water snails, but can tolerate salty water, and survive excessive heat and winter ice. They thrive in disturbed areas and survive floods better than other snails by burrowing into the mud. They attach themselves quickly to boats, anchors, waders, and fishing equipment for transportation to other lakes – as well using pets and wildlife like the legs of wading birds. Mud snails can live out of water for up to two weeks by closing their shells. And they can even survive traveling through the innards of fish or birds and make it out alive 50-80% of the time! We are talking about a tough competitor here in our waterways! There’s evidence that trout in the Au Sable River eat New Zealand Mud Snails, but they can’t get much nourishment from them. Their shells are too hard for most fish to crush or digest. Hence the nutrients in them don’t nourish fish like native snails or other macroinvertebrates in a river would. And to add more injury, these snails eat the very organic matter on which our native species depend, the species which efficiently nourish fish and other creatures. New Zealand Mud Snails, for example, eat the most tender parts of algae, but leave the less palatable parts for other aquatic creatures. Thanks a lot! Sadly, as is often the case with invasive species, there is no hope of ever eliminating these minute snails. They have no natural predators in North America. And if we tried to physically remove them but missed even one, we’d have hundreds of thousands again in a matter of years as the creatures clone and clone again. Clean, Drain and Dry All Boats, Watercraft and their Trailers – You’ll need to drain them for 24 hours before you go to another water system. Drain your live well, your bilge and dry your motor. Remember! These snails are tiny and easily missed! Look carefully! Clean Your Waders, Nets, etc. Go away from the water’s edge (near your car for instance) and spray your gear liberally with Formula 409, which right now is the only substance found to kill 100 % of these little critters. Don’t get any 409 in the water system! The surfactant that makes it work on the snails is lethal to many creatures. Be sure to brush/scour the soles of your boots or waders. Rinse the equipment with water, dry them, and wait 24 hours before going into another stream. Again, remember to check carefully for these tiny snails! Educate Others about These Procedures – Spread the word to other people in your life who fish. These snails prefer rivers where sunlight can reach the mud and grow algae. But they have been found in lakes as well, since rivers, of course, empty into lakes. Anglers can’t protect our waterways if they don’t really understand the dangers associated with these snails. Volunteer to Help – You can provide a water sample from a river in which you fish and submit it easily to the Aquatic Ecology Lab. Find out how by emailing Emily Bovee, one of the researchers from O. (See the researchers’ emails below.) A DNA test can discover whether mud snails are present in the waterways where you fish or boat. That helps researchers know where to do their work and allows conservationists to offer information on local signage and to strategically locate cleaning kiosks for fishing gear. It’s Not Fun to Think about Invasive Species…but We Really Need To Do It. I will readily admit that learning about invasive species is not as uplifting as learning about the restoration of forests, prairies and native species in general. Non-native species often end up dominating the landscape and thereby diminishing the rich diversity of our natural areas. And often the story of invasives does not have a clear ending, much less a happy one. For though we can work at controlling them, in many cases, we will never be entirely rid of them. It seems that our best hope is to get educated about invasive species and then pass on that understanding to others in the hope that we can dramatically limit the damage that they do. We can participate in citizen science projects. We can choose to be informed and careful about inadvertently spreading invasive plants, fungi or creatures when we garden, fish, hike or choose our pets. We can plant and nurture native flowers, grasses and trees. Seems do-able, doesn’t it? In fact, we’re already doing it here in Oakland Township through our stewardship program. And really, it seems like the least we can do to honor the diverse beauty and generosity of the natural areas which have supported us for thousands of years. A water sample kit to determine whether NZ Mud Snails are in the rivers you fish. Photo by Jeremy Geist. To participate in DNA water sampling, contact the research team at Oakland University’s Aquatic Ecology Lab by contacting Oakland University researcher Emily Bovee at this email address: enbovee@oakland.edu. As well as attending the excellent workshop, I found these two websites very useful.